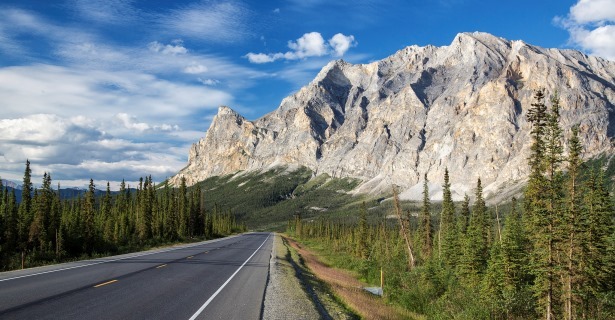 Dalton Highway, Alaska | Scenic Drive With Natural Beauty, Quaint Towns! The Dalton Highway, Alaska spans over a distance of about 666 km from the junction with Elliott Highway, 135 km from Fairbanks; to Prudhoe Bay an isolated community near the edge of the Arctic Ocean and takes drivers through some of the most beautiful parts of the state. In order to really make the most of your drive and natural surroundings, it is always a good idea to travel in a 4WD SUV vehicle. Start by filling up your tank and stocking up on water and food for the road in Fairbanks. You will then head for Livengood and on towards the Yukon Rover where you can enjoy the landscapes along with a delicious snack, meal or beverage. This part of the highway offers amazing changes in scenery. Do take care and keep your eyes open for bears. This is grizzly and black bear territory. You may also spot some caribou and other wildlife. When you do spot wild animals, it is always best to stay in your vehicle and observe from a distance. Your next stop is Coldfoot which is a good place to top up your tank since you won’t have any such services for almost 400km. Hereafter, make your way to the Brooks Range that towers 2,134m above. The road then takes you along the Arctic National Wildlife Refuge which is home to caribou and a nesting ground for various migratory birds. Brooks Range is an excellent place to give your vehicle a break and let your legs do some work. There are some excellent hiking opportunities around here. Do take waterproof boots that offer additional ankle support for these hikes! The terrain can be unpredictable so you will be grateful for that extra support! Not too far from here, you will reach the gates to the Arctic National Wildlife Refuge. If hiking, it is best to take a map along with you and even a GPS device if possible. The visitor center in this area offers storage barrels in which hikers can protect their food from bears. Next up is Atigun Pass which is the only pass in this mountain range. It is also the highest pass in Alaska. Many visitors enjoy trying their luck at searching for gold here using a pick, pan and shovel or other similar tools. The Dalton Highway Recreation Mineral Collection brochure will offer more information on where the best mining spots are. The Dalton Highway comes to an end in Prudhoe Bay. Tihs bay is known as the largest oil field in the USA and the company town in this area is known as Deadhorse. There are tours of the oil fields and other activities here include fishing for whitefish, Arctic grayling, Arctic char, lake trout and more.